Project Gallery — Joel B. Spaulding & Company, Inc.
Joel B. Spaulding & Company, Inc. Consulting engineers assisting rural and small communities since 1965. View select historic and project photos throughout different courses of construction. Sixth District Congressman William R. Anderson, above center, confers with Nolensville Utility District officials about an FHA loan. 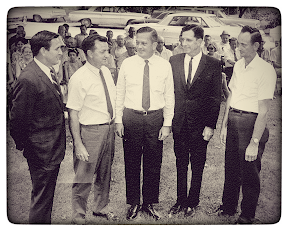 From left are Joel Spaulding, engineer, Ross Arnold, commissioner and president of the district, Anderson, County Judge Fulton Greer, and Charles Waggoner, commissioner and vice-president. Not present for the picture was J.S. Fly, commissioner and secretary. Published in the Review-Appeal (Williamson County news) July 4, 1968. Scotts Hill, TN 100 million gallon elevated steel tank. November, 1985. Nolensville / College Grove Utility District's headquarters. Completed in January, 2013. Provided full civil site design and permitting. Majority of the site was located within the 100-Year Flood Zone, and the site was completely pervious, causing challenges to drainage and stormwater management. Selmer, TN's Dixie Park Renovations, including a new splash pad, ADA-compliant bathroom, and parking lot. Completed in May, 2016. Provided full civil site design and permitting. Site located entirely within the floodway of Cypress Creek, which elevated the bathroom structure and caused drainage challenges within the parking lot. Tiptonville, TN streetscape rehabilitation. Completed in May, 2013. Provided ADA crossing design and administration/permitting through TDOT. Per TDOT's requirements, we were unable to alter or disturb the existing roadway, causing severe challenges to ADA ramp design and drainage. Additionally, no existing drainage structures could be removed, damaged, or re-aligned. "Before" photo depicting severe erosion along Crooked Creek within Selmer, TN's City Park. April, 2013. Provided full civil site design, permitting through TDEC and the US Army Corps of Engineers, and construction administration. Creek is located within the rare species habitat of the Hatchie Burrowing Crayfish, which required a survey from TDEC, TWRA, and TDOT prior to construction. Provided full coordination among these agencies to facilitate this survey. "After" photo depicting successful stabilization along Crooked Creek within Selmer, TN's City Park. Completed in 2014. Provided full civil site design, permitting through TDEC and the US Army Corps of Engineers, and construction administration. Port of Cates Landing, Tiptonville, TN. Provided water system design and layout. Carl Perkins Visitor Center. Provided full civil site design and permitting. Looking for full size pictures? Click here for the link to a larger gallery. Homepage for Joel B. Spaulding & Company, Inc. - Consulting Engineers. A Nashville-based civil engineering firm established in 1965. Article on our founder, Joel Spaulding from Building Tennessee in October of 1972. Joel B. Spaulding, Sr. (left) at the founding of the Nolensville / College Grove Utility District. Circa 1970. © 2019. Joel B. Spaulding & Company, Inc. All rights reserved.